1943 Simplicity #4775 vintage sewing pattern, misses' blouse and jumper, size 14. The blouse is styled with a forward shoulder seam and fitted at the waistline with tucks. Style 1 has a trim notched collar and a purchased tie may be worn with style 3. Choose long or short sleeves. 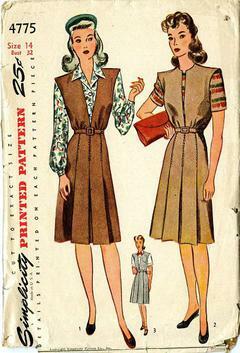 The jumper is gathered at the waistline and the skirt front is pleated. Missing piece 'R' pocket, sold AS-IS.